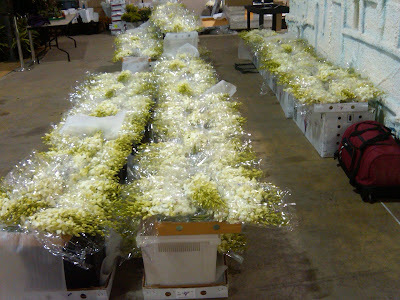 So today is the first full day of work on the Philadelphia Flower Show for team Schaffer! Bill Schaffer, AIFD, AAF, PFCI is so super-organized and very tidy. And his marketing for Polar Fantasy is amazing. I love the cards he is handing out, but I don’t want to reveal them until the show formally opens, so stay tuned! All of this, and he feeds us too! We had a terrific dinner at Maggiano’s last night, family style. We are a flower-family, yessir! And I am meeting new friends;Its always so much fun when my flower family grows. So it is another adventure for me, punctuated with terrific food, great talks, lots of laughs, and some serious snow. 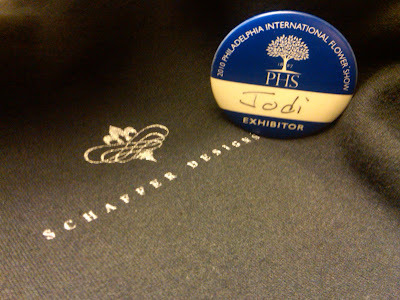 Looking forward to a full day of designing at the Philadelphia Flower Show!